The 1960 Scottish Marathon, finishing once again at the Old Meadowbank Stadium, took place on a particularly hot, sunny day. Gordon Eadie started cautiously and ran an even-paced race, making steady progress and passing the leaders in the later miles to win convincingly in 2.36.40 from Johnny Kerr (Airdrie Harriers) and Charlie Fraser of Edinburgh Southern Harriers. Gordon Eadie, a durable athlete who represented Scotland in the International Cross-Country Championships in 1961, won another silver medal in the 1966 Scottish Marathon and was still running good marathons in the 1970s. He was also a successful ultra-distance runner and was record-holder for the 44 miles of the solo Edinburgh to Glasgow race. John Kerr had been a cyclist and was known as ‘Jack’ to fellow bikers, although his mother disapproved of the abbreviation. Hugh Mitchell, one of those cyclists, remembers that John had a low but very powerful running action. Jackie Foster remembered him as ‘Johnny’ Kerr, and “rather ‘fat’ for a runner, probably weighing over eleven stones, compared to the nine and a half of ‘normal’ scraggy competitors. However, his wonderful positive attitude made him state that his extra weight was an advantage, as he had something to lose, unlike ‘skinny rabbits’ like Jackie himself!” Johnny had a low shuffling stride, and sweated profusely, appearing to stretch his vest and nylon shorts to the maximum. When Jackie worried once about an apparently classy field of opponents, Johnny retorted, ‘Nonsense. They just have two legs each like you and I,’ and then went on to win. One day the two of them were running the Strathallan twenty-miler on a red-hot day with black bubbles of tar forming on the road. They had broken away from the field at fifteen miles, and Jackie was highly chuffed at still keeping up with Johnny, and was looking forward to finishing second. With about half a mile to go, Jackie offered his rival one of the little refresher sweets he was carrying. Johnny Kerr stopped still immediately; and Jackie carried on to win in two hours two minutes. When Johnny did come onto the track some time later, he took off his peaked cap and jumped on it! He told Jackie later that he could not believe him fresh enough to offer him sweets after such a gruelling run. So for once, Johnny’s strong self-confidence was broken – although Jackie never beat him again. A very well-known Scottish Veteran Harrier and, much later on, a British M55 and M60 Marathon Record Holder, Bill McBrinn of Monkland Harriers, took up the story of the 1961 Scottish Marathon Championship. Falkirk to Meadowbank yet again and very warm. Bill had been a miler who occasionally tried longer road races like Brampton to Carlisle or Morpeth to Newcastle. When he decided to train for a marathon, his job as a Locomotive Fireman with British Rail caused problems. Shift work meant he had to run before work one week; and after work the next one. Hardly ideal since the work itself was heavy. Bill ran ten milers mainly, with a 14 mile effort now and then, and once a month 22-25 miles. He raced most weekends. In April 1961 he was pleased to finish fifth, beating Gordon Eadie, in the Clydebank to Helensburgh 16, won by Ian Harris of Beith Harriers, a Cross-Country International that year. Two weeks before the Scottish Marathon, Bill was second to John Kerr in the SMC 12. Johnny had been a member of Monkland, but joined Airdrie after a ‘fall-out’. Seven days before the Championship, Bill ran the Babcock and Wilcox 14, won by Andy Brown. Obviously, Bill did not ‘ease down’, and indeed ran ten miles two days before the race. On marathon morning, Bill devoured a large steak at 11 a.m. – the very opposite of ‘carbo-loading’! Dressed in his club cotton vest, shorts and the traditional Dunlop Green Flash tennis shoes, Bill toed the line. The Press made Ian Harris (of Beith and the Parachute Regiment) favourite. Bill preferred John Kerr – his stamina was not in doubt since he had completed the Edinburgh to Glasgow and other ‘ultras’. Four English runners turned up, poo-pooing the Scots chances and saying they would all break 2.30! Bill himself intended to gain a standard medal for breaking 2.50. He was unbothered by the heat, which suited him well. By 1962 Alastair Wood had moved up in distance and won the first of six Scottish Marathon Championships. Second was J. M. Kerr – a gold and two silvers in three years! Tragically John Kerr’s successful running career, and his life itself, was cut short soon afterwards. He was a purification engineer on the Clyde and on a freezing winter’s day he was taking water samples near Bothwell Bridge when the bosun’s chair snapped and he fell into the cold dirty water. The task was meant to be a two-man job, but unfortunately his workmate had not arrived, and John had decided to do the work on his own. The fire brigade rescued him, and he walked to the ambulance, but died there soon afterwards, from hypothermia. Jackie Foster wrote ‘A sad end for a really tough guy’. Johnny’s widow put up a memorial trophy which for many years went to the winner of the Airdrie 13. Nowadays it is presented to the victor in the popular Monklands Half Marathon. Alastair Wood, one of Scotland’s all-time best runners, should have written a book about his eventful athletics career, thoughtful training advice and controversial opinions. Mind you, he should have engaged a good libel lawyer first! 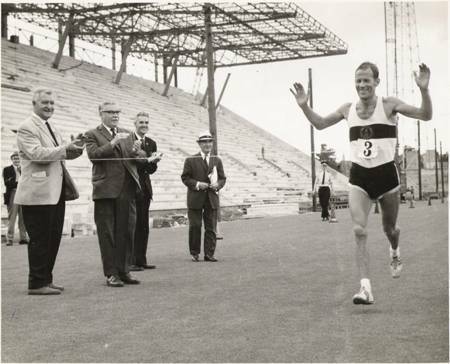 Born in Elgin, he went to Aberdeen University in 1952 and worked towards a degree in Political Economy, also competing successfully as a miler and three miler.In June 1955 he ran a mile in 4.15.9 and followed that with a bronze medal in the SAAA Championships at New Meadowbank. From 1956 to October 1959 he was an officer at RAF Halton. Thereafter he spent a year at Oxford University doing post-graduate work in Economics and Statistics., and also gaining blues for Athletics and Cross-country. In the RAF his commander was Bill Taylor, much later the president of the British Veteran Athletics Federation. Alastair remembered Bill as a really nice man and a great organiser – everything planned to the second. The 1948 Wembley Olympics red cinder track had been moved to RAF Halton. During his time in the RAF, Alastair did a lot of evening interval training in the dim light of street-lamps – sessions like 40 x 220 yards with a jog recovery across the centre of the track. He competed in Inter-Services competitions and (for Shettleston Harriers) 4th place in the 1958 nine-mile Scottish Cross-Country Championship on Hamilton Racecourse. In 1959 he won the event! Perhaps his best cross-country race was in the 1960 International, also in Hamilton, when he finished 7th beating that year’s Scottish champion, (and fine miler) Graham Everett, and the most unlikely ‘Scotsman’ Bruce Tulloh, who Alastair blamed for losing Scotland a team medal in a later event in Spain! Alastair ran for Scotland in the ICCU Championships for six years in succession – 1959 to 1964. 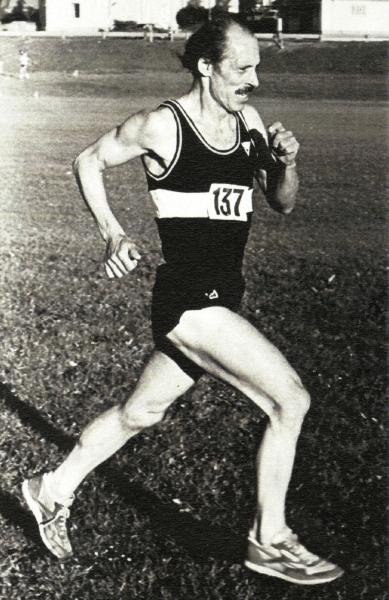 On the track, Alastair Wood won Scottish titles over 3 miles (1957 and 1959) and 6 miles (1958, 1959,1960 and 1961). He was Scottish Native Record Holder for both events. He ran in the 1958 Cardiff Commonwealth Games 6 miles on a very hot day, keeping up with the leaders for four miles before having to drop out. Alastair represented Britain at three miles, six miles, marathon – and in the steeplechase. By 1960 he was living in Aberdeen and gradually changed his club from Shettleston to Aberdeen AAC, which finished second team in the ‘National’ of 1962. His main training partner, just out of the RAF, was Steve Taylor (Scottish 3 mile champion in 1961 and 1962, and a Cross-country International in 1960, 1961 and 1962); and Dennis Whiting and Peter Duffy also took part in the two hours long Sunday runs which became part of local legend in the 60s and 70s. Alastair swore that the early sessions were not as viciously fast and competitive as they later became! Repetitions were also an important training ingredient. Alastair remembered that, on the Saturday of the SAAA Championships, he used to watch the marathon competitors trudging round the track to finish Falkirk to Meadowbank. Joe McGhee and Harry Fenion seemed like ‘funny little men in sandshoes’ to an unimpressed track athlete. Yet in 1962 he trained over a twenty mile course from Aberdeen out the North Deeside road to the Drum straight, across to Park and back in the South Deeside. One May evening he managed this in just over one hour forty minutes, which seemed ‘not bad’. Alastair Wood (Aberdeen AAC) remembered the new course as being very hilly, with a headwind on the way back. He decided to go for a good time and not be content to ‘sit and kick’. Andy Brown (who had recently run 2.25.28, and was favourite) and he contested the lead until Alastair broke away at a roundabout (about 18 miles) which they had to negotiate before heading in London Road and onto the gravel behind Meadowbank pavilion, where a small boy was almost knocked over by the tired Wood, who reached the finish in 2.24.59, a championship record. Second was Johnny Kerr (Airdrie H.) and third Charlie Fraser (ESH). Charlie, who ran for years with a calf muscle strapped up, had a short pitter-patter stride pattern, and had been a good cross-country and six miles track man. The 1962 AAA Marathon was in July at Welwyn Garden City, and Alastair ran splendidly to finish second to Brian Kilby. (Alastair won the prestigious Achilles Club gold medal for this performance, as he did again in 1967). Kilby, the best marathon specialist Wood competed against, went on to win the European Championship Marathon for Britain in Belgrade – a race in which Alastair finished a meritorious fourth. He remembered catching up on the bronze medallist in the later stages but ran out of distance, since he had followed the favourite, Popov, the European record holder, for too long before realising the Russian, who finished sixth, was having a bad day. Alastair is meant to have announced after the race that he was bored with the distance and would run no more marathons. However, for his fourth marathon of an arduous debut season at the event, Alastair Wood took part in the Commonwealth Games Marathon in Perth, Australia. It was the last day of the Games on a cold drizzly day quite unlike the previous roasting fortnight. Sadly Alastair was suffering from food poisoning, and the team manager Willie Carmichael didn’t hand out the pink pills to cure the problem. Brian Kilby was a convincing winner, with Dave Power second and another Australian, Rod Bonella, third. The unfortunate Alastair had to head for the bushes at 18 miles and subsequently spent three days in hospital. Alastair remembered teaming up with Mike Lindsay, Martyn Lucking and Mike Hildrey and confronting chief official Willie Carmichael, who was allegedly hoarding a number of items contributed by Australian sponsors i.e. ‘a team car, oceans of Swan lager, whisky and cigarettes. Each competitor should have received 1400 cigarettes and a thousand cans of lager. These might not have been consumed during the games but could have been used for presents back home.’ However a pleasant memory of the Perth Games was jogging with legendary figures like Arthur Lydiard, Peter Snell and Murray Halberg. Nevertheless, Alastair Wood was not keen on ‘Big Games’ – he objected to uniforms, officials and hanging around forever waiting for the marathon to start on the last day. 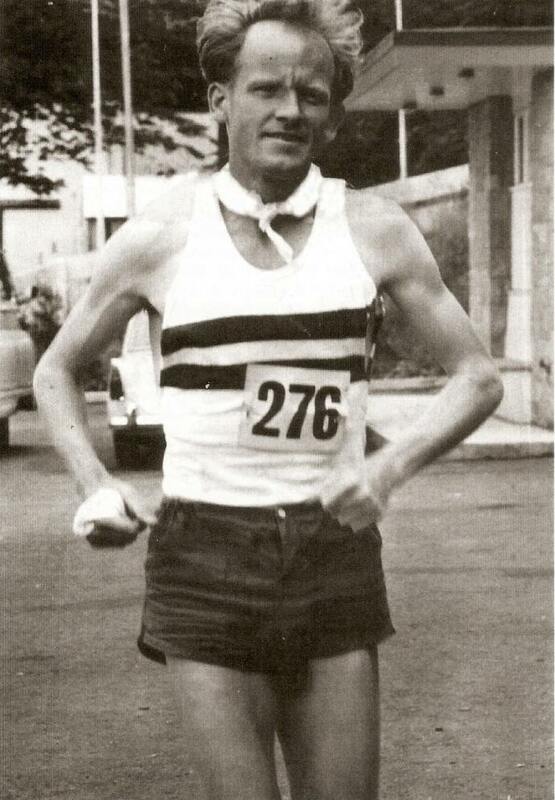 In 1963, Alastair Wood did not compete in the Scottish Marathon. Instead, he tried the famous Polytechnic event, in which Leonard ‘Buddy’ Edelen of the USA broke the world record in 2.14.28. Alastair had dropped out and was annoyed to sit in a car watching Edelen indulging in some ruthless course and corner –cutting! Undoubtedly Edelen would have won the race, but the record may have been achieved unfairly. Enter Jim Alder of Morpeth Harriers and Edinburgh AC, the famous Geordie Scot who is undoubtedly one of the finest competitors and most memorable and admirable characters, ever to don the national dark blue vest. Jim had won the Scottish Cross-country Championships on Hamilton Racecourse in 1962, had represented Scotland (in Belgium in 1963) and Britain in a road race in Barcelona. He’d also won the Edinburgh to North Berwick 22 and, most importantly, the English 20 mile championship. His training could be as much as 130 miles a week! So this improving 23 year old was favourite when it came to his marathon debut, four weeks after the 20. The Scottish Marathon was from Anniesland in Glasgow in 1963. An official told Jim that the course was out and back and ‘dead flat’. Jim described the 1963 race in his 1981 biography ‘Marathon and Chips’. “I took off from the gun and inside a mile was going away from the opposition. There were several gradual but long uphill stretches on the outer journey and at half way a small detour round a trading estate then the truth dawned! I had a similar terrain to negotiate on the return home! A two-minute lead was increased to three and a half minutes at twenty miles but I had slowed up appreciably over the last two miles……. The damage was done and the full penalty was yet to be exacted……..
At twenty-one miles I was barely at walking pace, everything ached, legs, body, mind. God! What had hit me? Approaching the outskirts of Glasgow I was just aware of shoppers , kids, dogs. All seemed to be looking at me – did I look all that bad? A Scottish athletic supporter shouting at me from the kerbside mentioned twenty-three miles – heavens more that three miles to go. My brain was numb – panic – but my aching body screamed to stop, mind and body in conflict. Decision, yes, I will walk one telegraph pole, jog one, God! Who is this passing me – a runner? I am beaten. Oh no. Ian Harris of Beith Harriers and the Parachute Regiment swept past me when I was walking, the indignity of the situation turned to horror – would the rest of the field catch me? What seemed an eternity eventually drew to a close, the stadium loomed up, into the entrance, 300 yards around a track and the end – bliss. As those officials were in sight, on the home straight a roar from the crowd raised me from my stupor – someone else was catching me. Careering from lane to lane over the finishing line only yards ahead of Clark Wallace, a respected veteran Scots runner. Oblivion! Next thing I recall is lying in the first-aid tent with three St. John Ambulance men looking down on me. Failure! The Scottish Marathon Championship in 1964 was over an easier course than in 1962. It finished at New Meadowbank, but went out through Portobello and Musselburgh, continuing until the turn about Aberlady. As usual, Alastair Wood (Aberdeen AAC) was not content to win, but pushed himself hard to break the Championship record for the second time in 2.24.00. Second was Hugh Mitchell of Shettleston in 2.35.01 and third Charles McAlinden (Babcock and Wilcox) in 2.39.22. By this time Alastair was running 80 to 100 miles per week including speedwork with Steve Taylor. Since Steve was faster, Alastair had to keep the recoveries short to ensure his superior stamina took effect! A notable feat in 1964 was by Jim Alder, who finished third in the AAA race in 2.17.46 to make him the first Scot to break 2.20. Hugh Mitchell, like Hugo Fox and John Kerr, had been a racing cyclist. After competing in time-trials over 10, 25 and 50 miles, and road races of up to 160 miles, he turned to cyclo-cross and cross-country running. Since ‘you learn to suffer on a bike’, he soon turned to distance road racing, and trained on the cycling model: a period of heavy mileage; then hillwork; and finally speedwork. Not unlike Lydiard schedules. From 1959 onwards, he tried some very big training weeks: starting at 140 miles, he built up to 200, tried to keep this amount up for a fortnight, and then eased down to 140 again. He emphasised ‘If you avoided injury, you felt very strong and fresh when you reduced the mileage to only 140’! Since Alastair Wood was a Shettleston clubmate for a time, Hugh Mitchell had several memories of this character. One is the pleasure of being in a winning Shettleston team in the Edinburgh to Glasgow Relay in 1959 – without either Alastair or Graham Everett, who were the best two runners in Scotland at the time. Hugh remembered Joe McGhee racing in at the end of leg 6, and being so excited that he set off without the baton and had to go back to fetch it! In a Shettleston Marathon he finished second, two and a half minutes behind Alastair, which showed Hugh’s stamina, since there had been the same time gap shortly before over the ‘Tom Scott 10’. He also remembers a long Dundee road race in which he was pursuing Wood on the outward journey. Eventually Alastair stopped and exclaimed ‘That’s Arbroath down there!’ It turned out that some children had moved the bollard which showed where to ‘turn back. Alastair swore he’d love to catch those kids, but would ‘kill’ the irresponsible officials! Alastair suffered even more later when he was sent off course near the end of the ‘Two Bridges’ when a clear leader, letting the Wight brothers through for first and second. Such problems are only suffered by fast front-runners! As well as many marathons, and the North Berwick to Edinburgh race (note the original direction), Hugh Mitchell was a successful ultra-distance runner: second and third in the ‘Two Bridges’; taking part in the Isle of Man 40 (a close race with the legendary John Tarrant) and the Liverpool to Blackpool 48; and twice finishing fourth in the London to Brighton classic. Hugh broke Gordon Eadie’s record to win the Edinburgh to Glasgow 44 mile solo race. 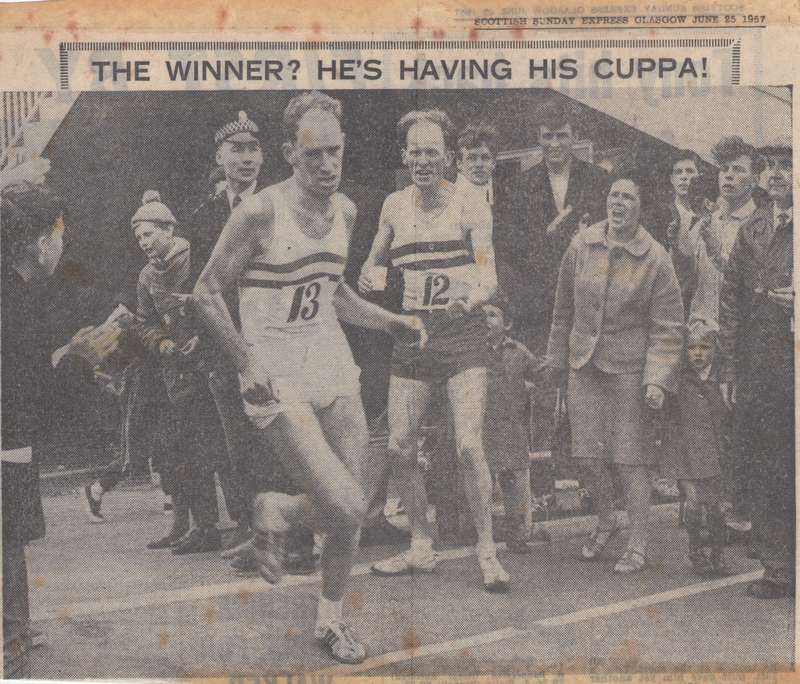 1965 was a tough Scottish Marathon – a genuine head to head between the reigning champion and a future one. That June, the course was out and back from Westerlands in Glasgow – a real switchback. 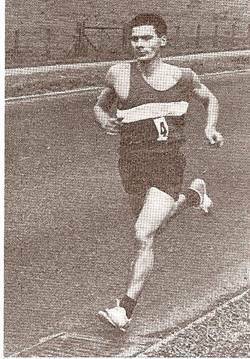 Donald Macgregor of Edinburgh Southern Harriers, who lived and worked in St Andrews, had finished 5th in the Cross-country ‘National’ and had run for Scotland in the ‘World Champs’ in Ostend. During April, in preparation for a debut marathon, he managed two training weeks of 100 miles each. Donald finished second to Alastair Wood in a hilly Dundee ten miler; and later at the end of April was given the verdict in the Clydebank-Helensburgh 16, after Alastair and he had run across the line together. This was not acceptable to one official who called the duo ‘a pair of sharkers’! Then, in May, Donald won the SAAA Track 10 in 50.23 – with Alastair second. The stage was set. In the marathon, Alastair and Donald were soon in front and at five miles, when Jack White of ESH blew his bugle and shouted, ‘Keep up, Donald’, Wood replied out of the side of his mouth, ‘Surely they don’t expect you to be dropped yet?’ As Donald wrote ‘This confidence paid off, since at about 19 miles I could keep up no more and he drew ahead yard by yard, while I floundered feebly and would fain have given up. But I struggled on, finishing in the almost deserted stadium in 2.22.24.’ Alastair Wood won in 2.20.46 – his third Championship record. Alastair remembered how hard it was to drop Donald, but recalls that he finally managed to break away up a long hill. Donald added ‘ I have a great ‘Daily Record’ photo showing me propped up by wee Dunky Wright and a couple of others, with a ‘Never Again’ expression on my face. 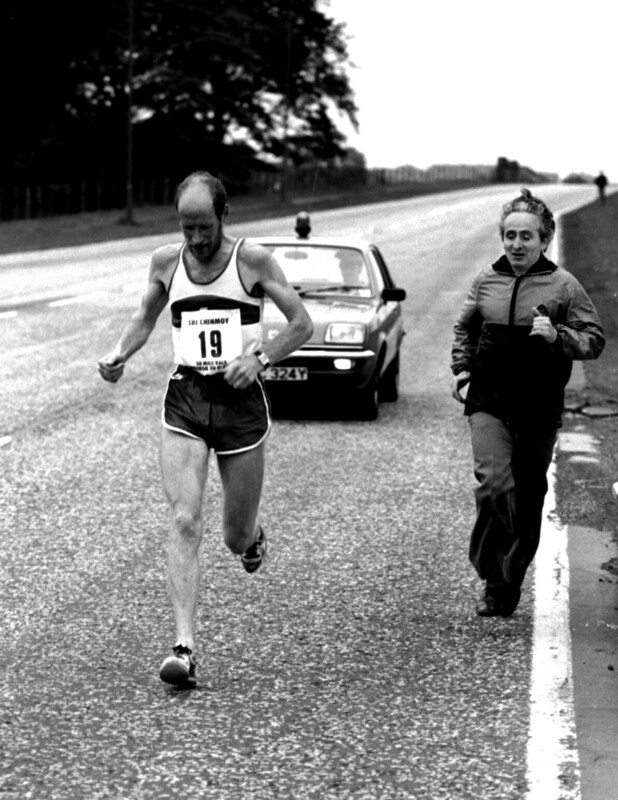 Over the full 26 miles, Alastair was too strong for me – as yet.’ (The six and a half years between them seemed significant – arguably Alastair reached his peak in 1966 and Donald in 1972.They also won World Veteran Marathons six years apart – Alastair in 1974 and Donald in 1980.) Later in 1965, Fergus Murray won the Shettleston event in 2.18.30 with Wood second in 2.19.03 – the first time that a marathon in Scotland had been completed in less than 2 hours 20 minutes. In 1966 the course was an undulating course from Westerlands in Glasgow, out to Vale of Leven and back. The weather was sunny and hot. Charlie McAlinden (Babcock and Wilcox), Irish half-mile champion back in 1956, had hopes of being selected for the European Championship team. 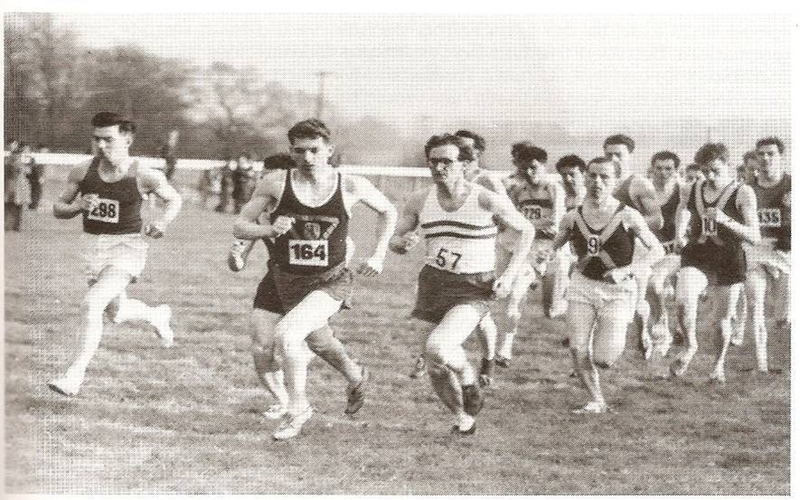 Although he had concentrated for most of his career on shorter track races, and had avoided running three and six mile events, he had been encouraged to try the 26 mile classic distance by Harry Fenion, the 1957 Scottish Marathon champion. In 1964 Charlie had won a bronze in the Scottish race, and in 1965 had finished 5th in the AAA Marathon at Port Talbot, in which Bill Adcocks was the winner, followed by Brian Kilby, Juan Taylor and Alastair Wood. By 1966, Charlie was a much-improved athlete and on form capable of a very good run. Gordon Eadie of Cambuslang, the 1960 winner, was also competing along with his team mate Andy Fleming. Newcomers included Donald Ritchie (Aberdeen AAC) who was attempting his second marathon and only beginning his illustrious distance running career; and Jack MacLean (Bellahouston H) who took part in sixteen Scottish marathon championships in succession, starting with this one! After a few miles the leaders began to stretch the field as they maintained a good pace. Hugh Mitchell (Shettleston), had been told before the race that sub-2.25 would be considered for the Jamaica marathon, so he moved ahead, accompanied by Charlie McAlinden. Further back, Gordon Eadie was running with a group containing Donald Ritchie. There was little change in the positions as Strathleven Industrial Estate, the half-way point, was reached. The runners completed a circuit of the grounds before returning to the roads. After keeping up 2.23 pace to twenty miles, Hugh Mitchell had to drop back, leaving Charlie on his own and feeling ‘hunted’. An extra problem he had to deal with was that he did not drink at all on this especially hot day. His friend Tony McManus was meant to hand him a special drink at twenty miles, but the officials of the time followed very strict rules about water stations, and Charlie had to carry on without refreshment. At 24 miles Hugh Mitchell dropped out. Gordon made an effort to close the gap on the leader and chased hard through 20 and 23 miles. He moved into second behind Charlie McAlinden. However the strain of racing fast in hot conditions was forcing some runners to give up and even the leaders were slowing down. Gordon could not manage to take the lead from a struggling Charlie, who found some strength in the last two miles to move away and win the battle in 2.26.31. Gordon Eadie finished in 2.28.19 with Andy Fleming, his Cambuslang clubmate and advisor, third in 2.32.47. The 1966 European Marathon was won by an Irish athlete – Jim Hogan, running for Britain! 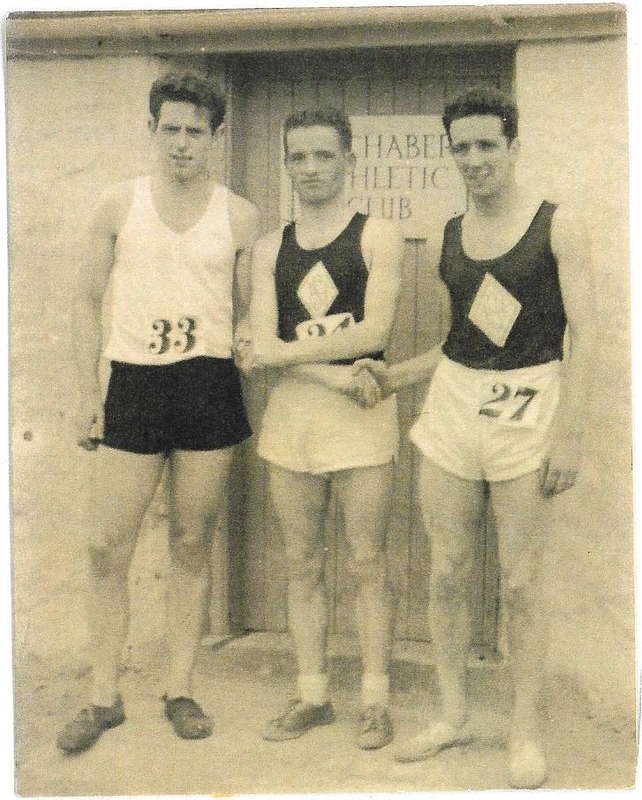 Although the Irish selectors sent home-based athletes to the European Championships, and ignored Glasgow-domiciled Charlie McAlinden, in later years he became a very successful veteran athlete, winning titles at 5000m, 10000m, ten miles, cross-country and marathon. In 1974 he was 9th in the World Veterans’ Marathon in France (won by A.J.Wood). In retirement, he lived in Aviemore and enjoyed hillwalking. Donald Ritchie with Hugh Mitchell as the ‘water boy’. Donald Ritchie managed 2.45.58. He wrote that he had been training between 70 and 90 miles a week including two interval sessions. Racing shoes were Tiger Cubs, which cost 37/6 from Stan Eldon Sports. On this occasion the weather was very warm, 80 degrees Fahrenheit, under a cloudless sky. The tar was melting on the roads, his feet hurt and he felt sick. The World Record-breaking Ultra-marathoner was not yet the finished article! Alastair Wood suffered once again in the Poly marathon, mainly due to extremely hot conditions, which affected all the top-class field of competitors, including Jim Alder, who finished not far in front of him. Before the race Alastair had put in his usual 80 to 100 miles per week including tough fartlek with Steve Taylor (efforts between a varying number of lamp-posts). Tired and disenchanted after the Polytechnic event, Alastair spent a month training differently – to fantastic effect. He is quoted as stating ‘The answer to fast running at any distance is to devote a considerable amount of time to moving faster than you plan to race’. He only ran every second day – and ‘to pass the time’ tried as many as sixty 220 strides! By the 9th of July and the Inverness to Forres marathon, he was full of energy, his knees coming up of their own accord! That day he made history by romping away to win in 2.13.45 – later ratified as a British and European best performance. It was a day on which Alastair felt he could ‘run forever’ and local rumour has it that he claimed to be ‘the fastest white man in the world’ behind an African (Abebe Bikila), a Japanese (Morio Shigematsu) and a Mongolian! Ming Campbell, who was Britain’s best sprinter in 1962, once referred in an article to Alastair as ‘the sardonic Alastair Wood’. This was not entirely inappropriate – but what a runner! A newspaper wished to pay Alastair’s expenses to compete in the Commonwealth Games marathon in Jamaica, but Alastair suspected that Scottish officials wouldn’t select him, and in any case was not keen to compete in another ‘Big Games’ so he turned down the offer. In Kingston on a predictably very hot day, Jim Alder triumphed, outsprinting Bill Adcocks of England after being misdirected and losing a fifteen second lead before reaching the track. A gold medal for Alder and Scotland! 1967 proved to be a peak year for Scottish marathon runners – who accomplished the fastest seven times by British runners that season! In the AAA Championships at Baddesley Colliery, Nuneaton, near Birmingham, Jim Alder won narrowly from Alastair Wood (2.16.08 to 2.16.21) with Donald Macgregor third in 2.17.19. Other Scottish stars were Fergus Murray (Edinburgh Southern Harriers); and Mel Edwards, (Aberdeen AAC) who won the Harlow Marathon in 2.18.25. Before his AAA run, Donald had completed three weeks of ‘intense hot-weather training in Vichy, France.’ He ran ten to fifteen miles in about six minute miles; and, on alternate days, a speed session, such as fartlek, or two miles of short sprints and short recoveries, or 30×200, or 4×600, or 4 times a mile in 5.00 to 5.30 with a 200 fast non-recovery! About seventy miles a week. This regime led to good track speed and a personal best in the marathon. Donald refered to Jim Alder as ‘the excitable Morpeth lad. ‘Have yow ever run a marathon? Have yow ever run a marathon?’ he would ask ill-informed journalists.’ Donald also alluded to Jim’s occasional pre-race pessimism. ‘Due for a bad un!’ he’d moan. ‘Sardonic Alastair’, another friend of Jim’s, related the tale of asking Jim how far he ran every week in training. ‘A hundred miles exactly. Five minute miles,’ came the crisp answer. ‘Five minutes exactly. A hundred miles a week.’ Jim would not be budged an inch or a second. A champion’s determination! Most acquaintances have a Jim Alder anecdote, such was the man’s unique personality, which inspired humour as well as great admiration and affection. Donald Ritchie reported that the out and back course started and finished at the stadium. It followed the A905 towards Stirling and was very flat. Feeling good, he kept up with Alastair Wood and Hugh Mitchell of Shettleston. Unfortunately they were misdirected by an incompetent marshall, and ended up at the back of the field again. Nevertheless, the two Aberdeen runners moved through and away, passing 5 miles in 26.12, 10 miles in 52.50 and the turn in 1.11.08. Donald was pleased to see a considerable gap to Alex Wight. Alastair moved away from the tiring Donald at about 14 miles. Donald stated that the remaining miles were tough, but he was delighted to hold on for second place. 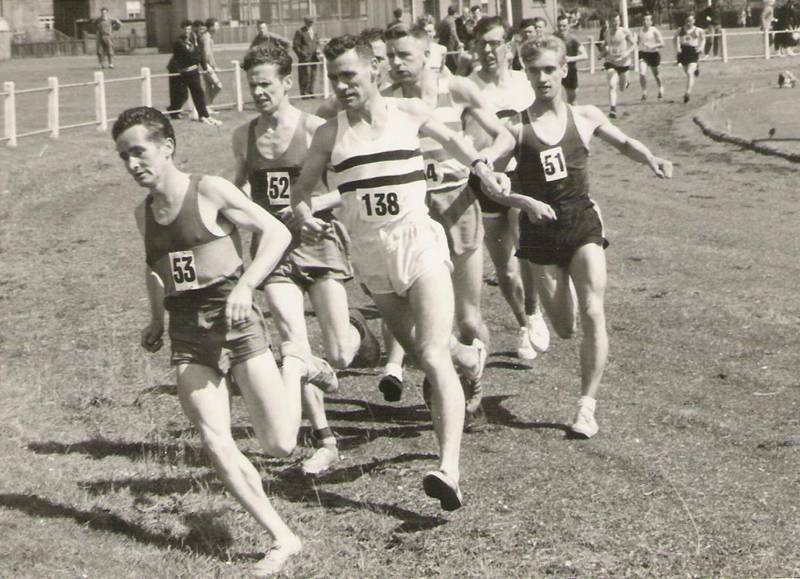 Other finishers included Brian Goodwin of Bellahouston in 2.29.56, the consistent Gordon Eadie fifth in 2.30.44, and Jim Wight of Edinburgh University in 2.34.34. The 1968 race, at Grangemouth again, was almost identical. First Alastair in 2.21.18 and second Donald Ritchie in 2.32.25, this time just in front of Don Turner of Pitreavie AAC in 2.32.42. Donald went off with Alastair once again, reaching one mile in 5.10 and 5 miles in 26.03. At this point Donald told his leader that he was finding the pace too fast, so Alastair slowed down, agreeing to run together until ten miles (53.01). Alastair reached the turn in 69.08 and Donald in 69.55. Donald had a difficult time running into a wind and paid the penalty for the ambitious pace. He struggled through 20 in 1.52, aware that Don Turner was beginning to catch up. Donald Ritchie had cramps in his right leg and could not straighten it or bend it back properly. At the end he was only about 60 yards ahead of Turner, and ‘was quite sick once he tried drinking various liquids’. All this despite the fact that his training mileage was regularly over 100 miles per week by now. Yet no doubt Donald’s ability to suffer but fight on was to be crucial once he turned to ultras. Don Turner, later president of the famous Road Runners Club, lived in Inverkeithing from 1959 to 1964, before returning south. He won the inaugural ‘Two Bridges’ race in 1968, from Hugh Mitchell, and was encouraged by his Pitreavie clubmate John Linaker, and outstanding cross-courtry and track runner (especially Steeplechase). Don organised two 40 mile track races, during one of which Alastair Wood broke the World Record. In the 1968 Scottish Marathon, Don remembered being told that Ritchie was struggling but ‘could never actually see the so-and-so’! Don Turner was another man, like Hugh Mitchell, who ran enormous mileages in training. 1968 produced a notable performance by Jim Alder who ran 2.14.14 in the Poly and was selected for the Mexico Olympics. Unfortunately, the high altitude forced even this toughest of competitors to drop out. However he returned to form with an excellent run in the 1969 European Championships marathon in Athens, winning a bronze medal in 2.19.05 over the hilly course from Marathon itself. The Scottish Championship marathon in 1969 should be very easy to describe, since four participants have passed on information about the event! Jack MacLean of Bellahouston mentioned that the new course started and finished at the half-completed Meadowbank stadium in Edinburgh, which was to be the venue for the Commonwealth Games in August 1970. The track was ready but little else, so competitors stripped at the rugby ground Jock’s Lodge. The Lord Provost of Edinburgh, Sir Herbert Brechin, started the race – eventually – after two false starts since the gun wouldn’t fire. The 23 competitors were the first athletes to try out the £60,000 ‘tartan’ track, part of a two and a half million pounds sports complex. Alastair Wood supervised communications in the stadium, since the officials were anxious to make the race a proper try-out for the Games. However Jack said that ‘the SAAA did not want to know about the marathon. The organisation was left to us in the Scottish Marathon Club to do everything: timekeepers, sponge stations, everything. The SAAA was only too happy to have the responsibility removed from them. The Secretary of the SMC for years was wee Jimmy Scott. He was the Club – an enthusiastic and tireless worker on behalf of road-running in Scotland and not always appreciated.’ Jack should have known since he was Club Captain and a committee member for years. Bill Stoddart winning the SAAA marathon championship in 1969 watched by Dunky Wright, fourth from left. Jack worked for the Daily Record as a printer, but also knew lots of the Editorial department. “The week before the 1969 marathon, Alec Cameron, who wrote about athletics in the summer, asked me who was going to win the race. My reply was, barring mishaps, Bill Stoddart. Alec asked, ‘Is he articulate?’ and I said, ‘He sure is!’” Apparently back in 1957 Alec had not enjoyed a difficult television interview with that year’s winner Harry Fenion, who was a modest man of few words with a stutter when he was nervous. So Alec hoped that Bill, who possessed few nerves and many words, would win! The runners covered one lap of the track and left the stadium to the cheers of a few workmen, since spectators were banned from the site. Donald Ritchie also took part and indeed shared the early lead with Bill Stoddart (Greenock Wellpark Harriers). The course was Restalrig Avenue, Joppa, Musselburgh, Seton Level Crossing, Longniddry and the Chance Inn Bridge, where competitors turned for home. At three miles they were joined by Jim Wight (Edinburgh A.C.), who later became an international marathon runner. Police, motor-cycles, patrol cars, ambulances and carloads of officials shadowed the runners through the city streets and out over the country course. However by five miles Donald felt the side of his right foot burning and nipping but decided to press on. Jim lost contact on a hill at seven miles. Bill put in an effort before ten miles and passed that mark six seconds clear in 54.10. Donald’s foot was giving him great pain so he stopped at eleven miles to investigate. A three inch blister on the sole had burst. Even Donald could not restart and had to return to the stadium in an ambulance. He had ‘modified’ a pair of EB racing shoes to reduce weight and increase breathability. That is, he had cut holes in them, succeeding only in reducing stability, allowing excessive foot motion, friction – and disaster. Bill Stoddart’s winning time was 2.27.25. Second was Hugh Mitchell of Shettleston in 2.31.30; and third was Peter Duffy (Motherwell Y.M.C.A.) in 2.37.04. Other finishers inside the Scottish standard of 2.45 were Bill MacDonald (Inverness Harriers) 2.37.32; T.P. Russell (E.A.C.) 2.38.49; and Willie Russell (Shettleston) 2.42.28. Peter trained hard, both for Motherwell and when he was living in Aberdeen in the mid 1960s. From 1966-71 he was based in Motherwell and trained to and from work Monday to Thursday; ran a third daily session on Tuesday and Thursday (repetitions with Bert Mackay et al); an easy jog on Friday; racing or hill reps on Saturday; and up to two and a half hours on Sunday. That was thirteen sessions a week. He remembered (sympathetically, of course) that when Fraser Clyne started running about 1975, he came out with Peter and John Graham one winter Sunday and had ‘a bad day in the snow’. When the other two went back to rescue Fraser, he was found ‘holding on to a lamp-post at Newhouse’! Alastair Wood had a good race late in 1969. The event was the First Canadian National Exhibition Marathon in Toronto. This started in the dark at 8.20 p.m. – to ensure that the finish would not interfere with stadium entertainment starring Bob Hope! Each competitor was accompanied by his personal police motor-cyclist! Alastair remembered being amused (and mildly embarrassed) by the parade before the start, featuring uniformed national teams from Mexico, USA and New Zealand. They looked slightly more professional than Alastair and his Scotland team-mate Pat Maclagan, in their ordinary warm-up gear. Team racing kit was also in evidence. Alastair remembered competing in a plain vest and a very small, frayed pair of faded red shorts. These suffered during the rigours of the race, and Alastair finished (in the merciful murk) wearing a small mini-kilt! Typically Scottish or what? Anyone wanting a flash of this patriotic garb should consult page 144 of the 1984 ‘Guinness Book of the Marathon’ which shows the race leaders in action – Jack Foster (NZ, first in 2.16), Alastair Wood (second in 2.18) and Jeff Julian (NZ, third).